The tea and sugar has run out. The train that brings the supplies only comes on Thursdays. But the first Thursday of December is the day the children of the Plain wait for. It is when Father Christmas travels the line. 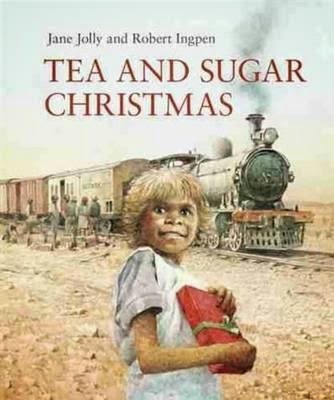 Ingpen’s extraordinary art captures the essence of the outback plains, the indigenous children’s longing and anticipation for the one thing that brings the outside world closer to them - the Tea and Sugar Train. The art and prose encompasses all life in the outback, which includes the post-war migrants that came from Europe to work on the East- West line, and their lives in railway camps. It comes alive under Ingpen’s masterful strokes like a stage production. The outstanding pencil portraits of the children and Father Christmas, and the divine double-page fold-out illustrations that magnify the settings, bring wondrous detail and action into focus. The story of the Tea and Sugar Train that from 1915 to 1996 travelled from Port Augusta to Kalgoorlie once a week, is a page taken from our rich history of migration and development. It retraces the forming of the outback, the people’s way of life, and their tremendous contribution to our country. An outstanding production presented in Jane Jolly’s excellent narrative. It’s a priceless addition to any bookcase.